While passing through Chicago’s Uptown neighbourhood, there was a moment of wanting some Vietnamese food from one of the many restaurants along the Argyle-Broadway stretch. With it being hot and humid outside, I decided against a pho and knowing how much I love spicy food, I opted against any peppery dishes. During my indecision, I had wandered over towards Sheridan Road and walked up on a Mexican restaurant named Riques Cocina Mexicana at 5004 N. Sheridan Road. I settled on returning to the area for Vietnamese food another day. For this day, Mexican would suffice. 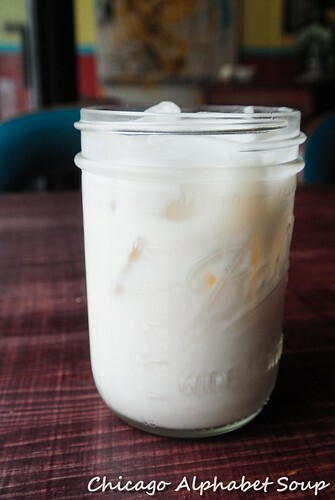 To somewhat take the edge off of the balmy feeling from outside, I had a horchata. It was clear from the first sip that this was not horchata from a bottle. I kid you not when I say that I could have ordered a jug of it for taking home. To keep from stuffing myself, I passed on ordering an appetizer and ordered a main dish of chiliquiles rojo con pollo instead. Shredded chicken, scrambled eggs, and toasted frijoles in a red sauce topped with queso fresco were all I needed to satisfy my craving. 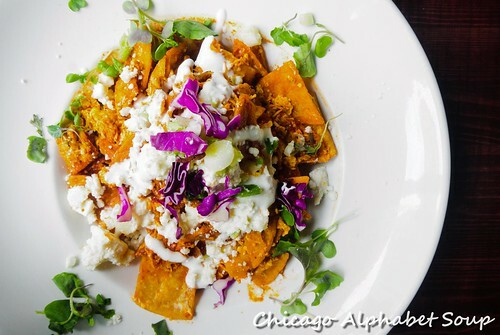 Having had chiliquiles at numerous Mexican restaurants in Chicago since I moved to the city in 1995, I can honestly say that this was the best that I have had. And the side of frijoles and sweet plantanos made for an excellent lunch option. As filling as the chiliquiles were, the dish was not so heavy that I did not have any room for a postre. 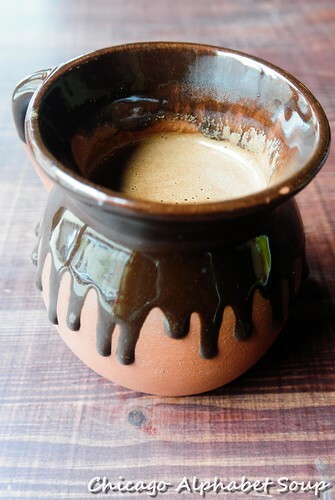 I ordered a “la dona” noir, which was hot chocolate, cacao barry, and espresso. Just to be different, I asked for it to be prepared spicy with ancho and chipotle chilis. Needless to say, I got something spicy when that was what I was initially trying to avoid doing. The drink was outstanding. But what made me dance in my seat was the flan de elote. I am now addicted to flan with corn in it. 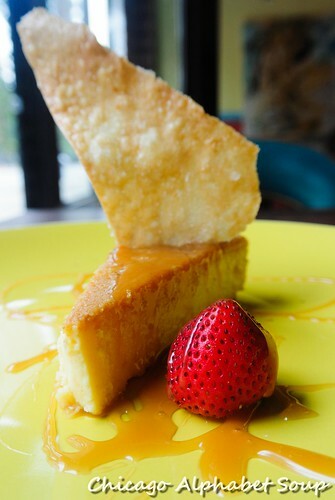 The texture is not smooth the way regular flan is and it is not as sweet either, but it is still a fiesta on the tongue. 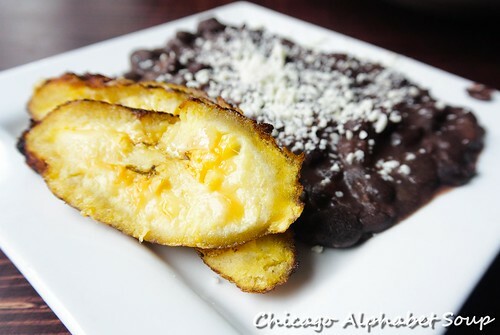 Riques Cocina Mexicana is a cozy restaurant with plenty of seating. Having gone during the middle of the day, there were several parties of individuals. 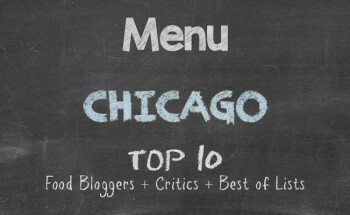 With food and service being as great as what I experienced, I am sure there is a crowd during the evening seating. Although the plating looks more appealing than what you get at traditional Mexican restaurants, the flavour is absolutely true to Mexican cooking. When I eat enough to the point of stumbling out the door like a drunkard and needing to have a nap, it is definitely good. Believe me when I say that I stumbled to the el station, dozed on the el, napped on the bus, and slept well when I arrived home. 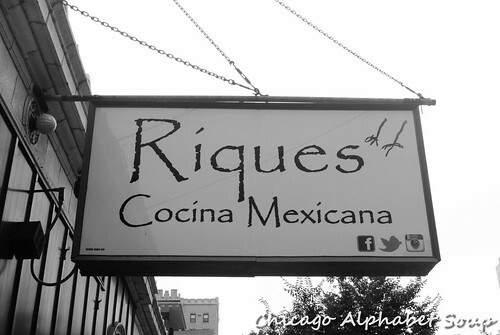 I had an uninterrupted dream about Riques Cocina Mexicana.